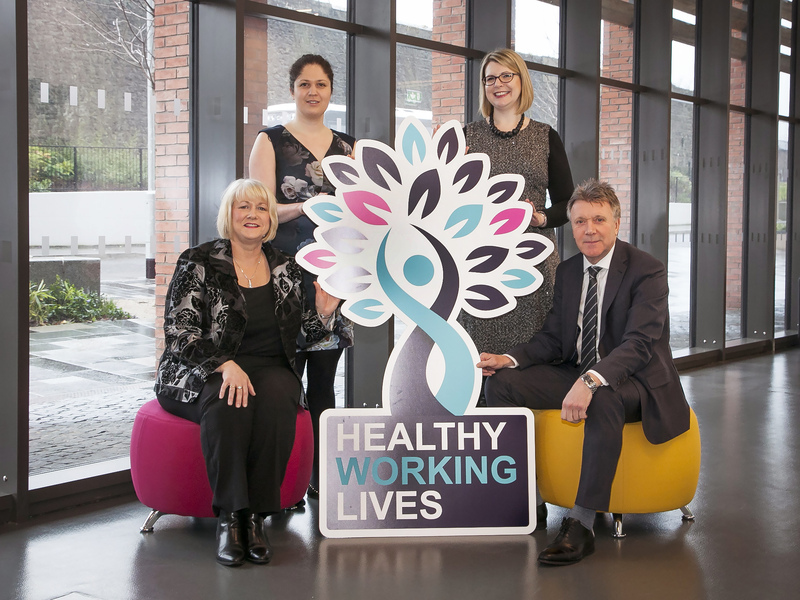 Over 150 business people from across Northern Ireland gathered at Girdwood Community Hub, Belfast on Thursday 15 March for the sixth annual Healthy Working Lives Conference to explore the issues and opportunities associated with diversity and inclusion in the workplace. Pictured at the Conference: (back row) Lizzie Yardley, Chartered Occupational Psychologist, Pearn Kandola and Megan Horsburgh, Head of Diversity and Inclusion, Sodexo; (front row) Janet Calvert, Health and Wellbeing Improvement Manager, Public Health Agency and Kieran Harding, Managing Director, Business in the Community. The Business in the Community and Public Health Agency (PHA) conference, aimed to raise awareness of the inclusivity agenda within the workplace, with a focus on working families, health inequalities and disability, and LGBT employees. Business in the Community’s Head of Workplace, Nicola Thompson, said: “An inclusive workplace is one where everyone feels valued, respected and supported. A truly inclusive workplace focusses on the needs of every individual, and ensures the right conditions are in place for each person to achieve his or her full potential. Attracting delegates from across the public, private and voluntary sectors, the half-day event featured a range of speakers from local and national businesses as well as relevant charities and support agencies. The conference focussed specifically on key issues affecting NI employers such as working families, LGBT, and health inequalities and disabilities. Valerie Watts, Interim Chief Executive of the PHA, said: “With 70% of the working-age population in Northern Ireland currently in employment*, the workplace is an ideal setting to share positive attitudes and behaviours, and affect cultural change. When employees feel valued this can have an important positive impact on health and wellbeing not just in the workplace but to the society as a whole. If you would like to find out more about Inclusion at Work, please contact nicola.thompson@bitcni.org.uk, or call (028) 9046 0606.